Sitting in front (left to right): 1. unidentified, 2. unidentified, 3. unidentified, 4. unidentified, 5. unidentified, 6. unidentified, 7. unidentified. Standing: 1. unidentified (standing farthest to the left), 2. unidentified, 3. Zenaida Sengo (standing in back, with the green top), 4. unidentified, 5. Catherine Larson, 6. Jaime Broch[sp? ], 7. unidentified, 8. unidentified, 9. unidentified (standing on the far right). Standing behind the class: Mrs Marty. Credits: From the collection of Catherine Larson. Thanks to Catherine Larson for identifying the kids in this picture. The kids in the picture are members of the high school graduation class of 1995. To find other pictures of the class of 1995 in the archive, see Livermore class pictures listed by year of high school graduation: 1995. And if you have any pictures of the class of 1995 that you would like to share, please submit them to the Archive. 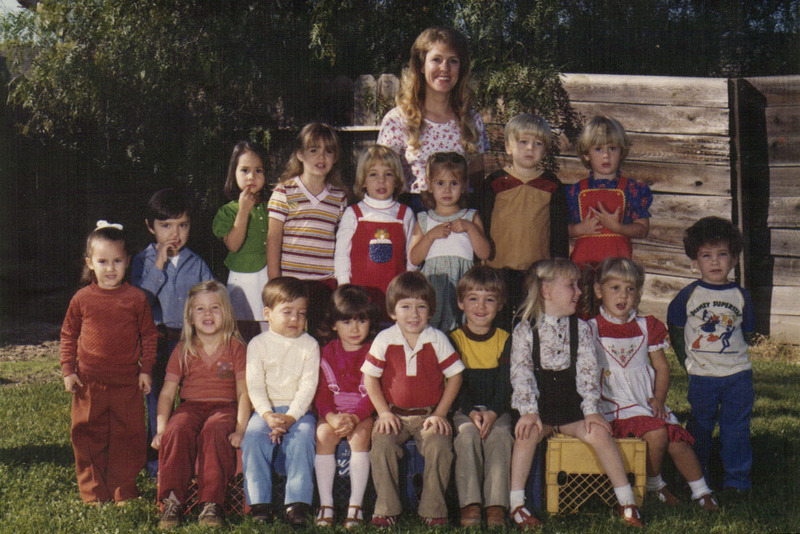 To find other pictures from The Ark Preschool in the archive, see Livermore class pictures listed by school: The Ark Preschool. And if you have any pictures from The Ark Preschool that you would like to share, please submit them to the Archive.